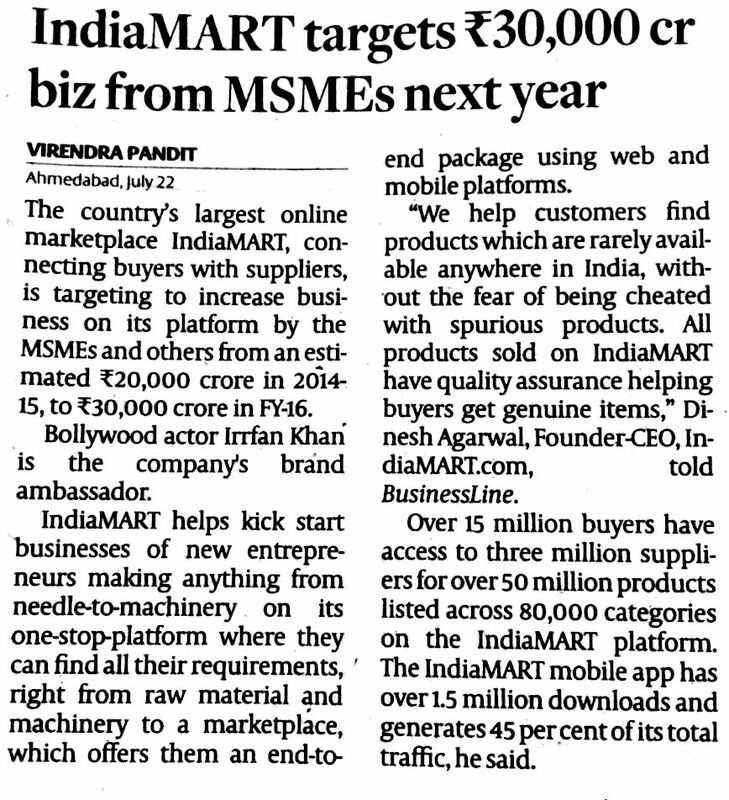 Enthused with the arrival of biggies like Tata Motors and IndianOil on its platform, the country’s largest online marketplace IndiaMART, connecting buyers with suppliers, is targeting to increase business on its platform by the MSMEs and others from an estimated Rs 20,000 crore in 2014-15, to Rs 30,000 crore in FY16. Ace actor Irrfan Khan is the company’s brand ambassador. IndiaMART helps kick start businesses of new entrepreneurs making anything from needle-to-machinery on its one-stop-platform where they can find all their requirements, right from raw material and machinery to a marketplace, which offers them an end-to-end package using web and mobile platforms. “We help customers find products which are rarely available anywhere in India, without the fear of being cheated with spurious products. All products sold on IndiaMART have quality assurance helping buyers get genuine items,” Dinesh Agarwal, Founder-CEO, IndiaMART.com, told BusinessLine. Over 15 million buyers have access to 3 million suppliers for over 50 million products listed across 80,000 categories on the IndiaMART platform. The company has over 100,000 paid customers. The IndiaMART mobile app has over 1.5 million downloads and generates 45 per cent of its total traffic, he said. The cash-rich company’s revenues come mainly from the suppliers’ advertisements and targeted subscriptions. “Our CAGR was 35% and revenues Rs 225 crore in 2014-15. In the first quarter of FY16, CAGR has increased to 73% and we hope to increase revenues to Rs 365 crore this fiscal,” said Agarwal. IndiaMART’s existing investors include Intel Capital, which invested Rs 50 crore in 2009, and Bennett, Coleman & Co. Ltd, which invested Rs 15 crore for a 5 per cent equity. For its commitment to bring affordable and low-cost solutions to the SMEs, the company was bestowed with the Manthan Award in 2013 under the ‘E-business and Financial Inclusion’ category, Agarwal said.